The PH 9.0 takes the reference performance of the PH 150 tube phono stage to a level of performance that belies its affordable price. The Modwright PH 9.0 retains the flexible MC cartridge loading and gain adjustment of the PH 150 and utilizes similar circuitry. However, the PH 9,0 is in a smaller enclosure that allows for greater flexibility in placement. The 10" x 10" x 4" external power supply can be hidden and 6ft umbilical allow for ease of setup and placement. Modwright also chose wisely in implementing Lundahl MC step-up transformers, and separate MM and MC inputs. The use of external supply, careful grounding, layout and solid engineering result in an extremely quiet tube phono stage. The PH 9.0 uses the same (2) 6C45 and (2) 6922 tube complement of the PH 150 and embodies the same tonality, soundstage and musical presentation. Max MC and MM gain of 64dB and 52dB respectively, as well as 0dB, -6dB and -12dB gain adjustment, accommodate a broad range of MM and MC cartridges. The back panel features one set each, MM and MC RCA inputs and one set of RCA main outs. The PH 9.0 can be fitted with (at an additional cost) fully balanced, transformer coupled XLR main outs. Turntables with two tone arms are easily accommodated, and with an outboard step-up transformer for the MM input, two MC cartridges may also be used. 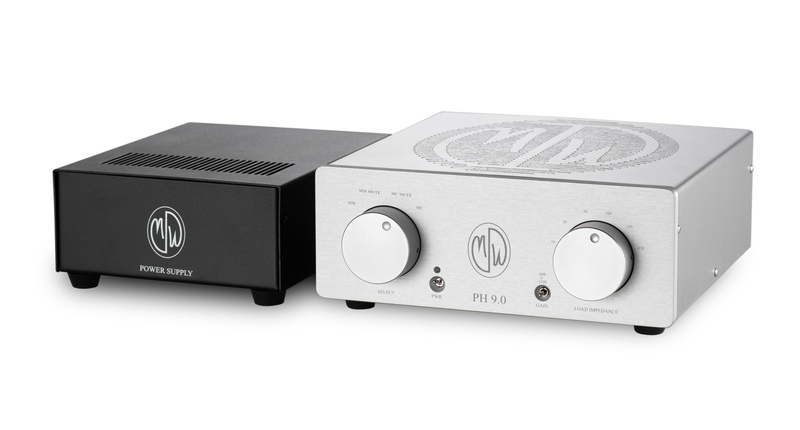 Click the button below to add the PH 9.0 Tube Phono Stage to your wish list.